Vita Vibe Ballet Barre - SHS240-W - 20ft. Traditional Wood Single Fixed Height Floor Mount Ballet Bar - Stretch/Dance Bar - USA Made by Vita Vibe Floor Mount Ballet Barres at H Highland. MPN: SHS240-W. Hurry! Limited time offer. Offer valid only while supplies last. 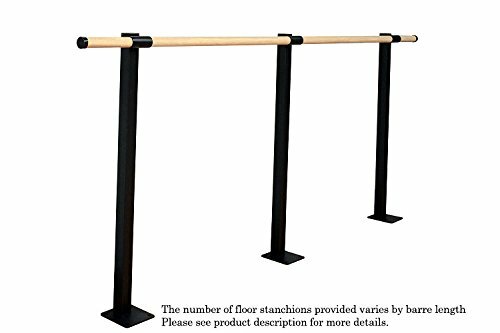 20 Foot wide adjustable height floor mounted traditional wood ballet barre consists of (1) 20ft hardwood ash barre run and (6) FS2 floor stanchions. 20 Foot wide adjustable height floor mounted traditional wood ballet barre consists of (1) 20ft hardwood ash barre run and (6) FS2 floor stanchions. The 20ft barre run ships as two 8' barres and one 4' barre to be joined together by the stanchion. Vita Vibe Traditional Wood Barres are 1-1/2" diameter sanded smooth, finish ready natural hardwood Ash barres. This allows you the option of staining to your desired color, however; leaving the barre to naturally patina over time is the preferred choice for commercial use. Each barre end is finished with black textured end-cap. The FS2 Fixed Height Floor Stanchions consist of a 6"x6"x1/4" laser cut base plate with four 3/18" mounting holes, 2" square 14 gauge heavy wall steel tubing, and a 4" wide collar set at 42" above the floor surface to accept the barre. The floor stanchions have a beautiful powder-coated texture matte black finish. All hardware (with the exception of floor anchors) is included. Easy do it yourself installation. Please visit our storefront for other available sizes and configurations.